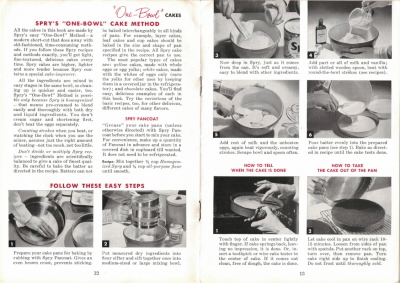 Here are pages 12 and 13 of the vintage cookbook: Home Baking Made Easy that was published in 1953 by Lever Brothers Company. 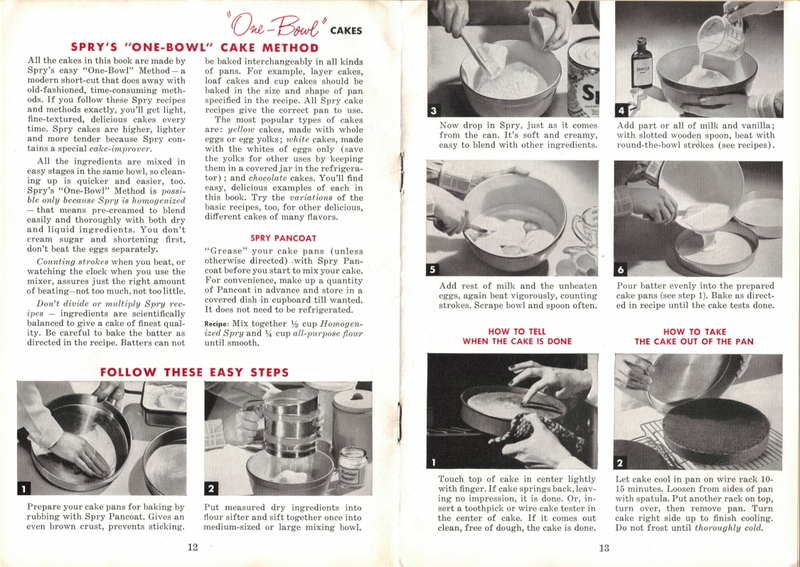 All the cakes in this book are made by Spry’s easy “One-Bowl” Method–a modern short-cut that does away with old-fashioned, time-consuming methods. If you follow these Spry recipes and methods exactly, you’ll get light, fine-textured, delicious cakes every time. Spry cakes are higher, lighter and more tender because Spry contains a special cake-improver. All the ingredients are mixed in easy stages in the same bowl, so cleaning up is quicker and easier, too. 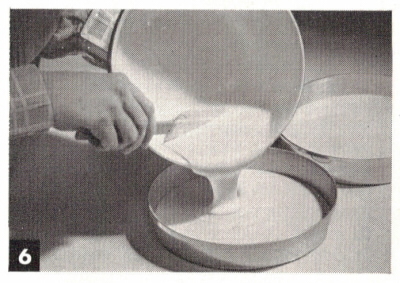 Spry’s “One-Bowl” Method is possible only because Spry is homogenized–that means pre-creamed to blend easily and thoroughly with both dry and liquid ingredients. You don’t cream sugar and shortening first, don’t beat the eggs separately. Counting strokes when you beat, or watching the clock when you use the mixer, assures just the right amount of beating–not too much, not too little. Don’t divide or multiply Spry recipes — ingredients are scientifically balanced to give a cake of finest quality. Be careful to bake the batter as directed in the recipe. Batters can not be baked interchangeably in all kinds of pans. 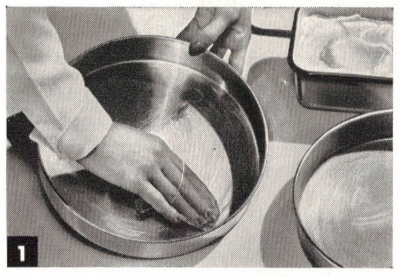 For example, layer cakes, loaf cakes and cup cakes should be baked in the size and shape of pan specified in the recipe. All Spry cake recipes give the correct pan to use. The most popular types of cakes are: yellow cakes, made with whole eggs or egg yolks; white cakes, made with the whites of eggs only (save the yolks for other uses by keeping them in a covered jar in the refrigerator); and chocolate cakes. You’ll find easy, delicious examples of each in this book. Try the variations of the basic recipes, too, for other delicious, different cakes of many flavors. 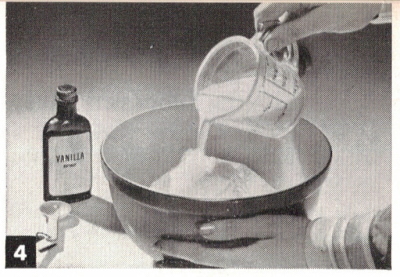 “Grease” your cake pans (unless otherwise directed) with Spry Pancoat before you start to mix your cake. For convenience, make up a quantity of Pancoat in advance and store in a covered dish in cupboard till wanted. It does not need to be refrigerated. Recipe: Mix together 1/2 cup Homogenized Spry and 1/4 cup all-purpose flour until smooth. Prepare your cake pans for baking by rubbing with Spry Pancoat. Gives an even brown crust, prevents sticking. 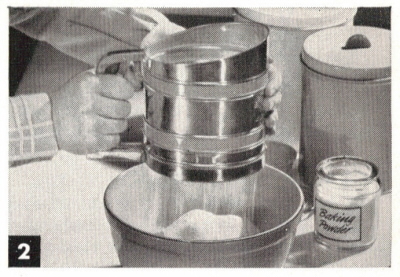 Put measured dry ingredients into flour sifter and sift together once into medium-sized or large mixing bowl. Now drop in Spry, just as it comes from the can. It’s soft and creamy, easy to blend with other ingredients. 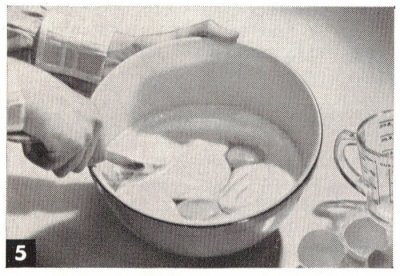 Add part or all of milk and vanilla; with slotted wooden spoon, beat with round-the-bowl strokes (see recipes). Add rest of milk and the unbeaten eggs, again beat vigorously, counting strokes. Scrape bowl and spoon often. 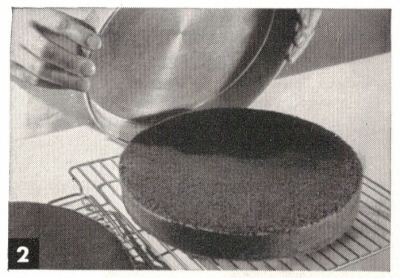 Pour batter evenly into the prepared cake pans (see step 1). Bake as directed in recipe until the cake tests done. 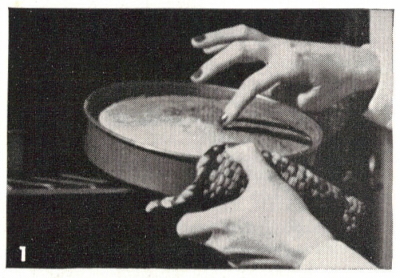 Touch top of cake in center lightly with finger. If cake springs back, leaving no impression, it is done. Or, insert a toothpick or wire cake tester in the center of cake. 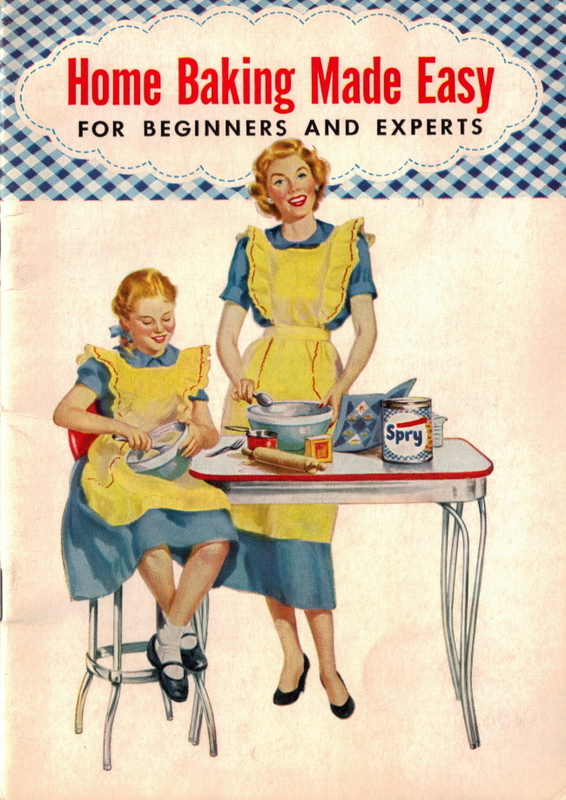 If it comes out clean, free of dough, the cake is done. Let cake cool in pan on wire rack 10-15 minutes. Loose from sides of pan with spatula. Put another rack on top, turn over, then remove pan. Turn cake right side up to finish cooling. Do not frost until thoroughly cold. I’ve made two SPRY recipe cakes. They both were delicious and a big hit with my guests. Of course I used the “other brand’ instead of SPRY. And I also halved the fat and added half butter. 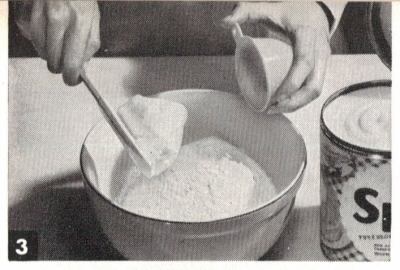 After Spry Pancoat, next heading is Recipe & says mix 1/2 cup spry & 1/4 cup flour, then in the steps below you mention adding milk, eggs, etc. but I don’t see how much of each? ?